Ulma Construction has recently released new formwork systems for walls and columns, new standardised solutions for bridges and tunnels, and new safety systems for both personal and collective protection. At Ulma Construction, new developments and trends in building construction, paired with careful attention to customer feedback on projects, guide the innovation of our systems. The search for efficiency in lightness, flexibility, and strength has given rise to a new modular formwork system for walls and columns: LGW. Designed for residential construction, the system strikes a perfect balance between strength and weight in the most cost-efficient way possible. The ease of assembly and use make it the best option available on the lightweight formwork market today. Meeting the same flexibility and strength requirements, Biramax is an innovative solution for circular formwork systems. Adjustable, easy to assemble, and cost-efficient both for its ease of use and extreme durability, it allows for the construction of storage tank walls and other circular structures of any radii. The result is a product that stands above the competition: safe, effective, and capable of withstanding considerable pouring pressure. We are committed to prolonging the working life of all Ulma Construction systems. This is why we have decided to increase our range of galvanised modular formwork products, so as to guarantee high performance over an extended pieriod of time. The complexity of large-scale infrastructural projects requires systems that optimise performance at each phase of work. With this in mind, we have developed the MK System to include new applications for bridges and tunnels, with the additional benefit of employing standardised material available for hire. Standardising mine tunnel construction with the MK System means considerable customer savings in an area where solutions until now have exclusively been customised. 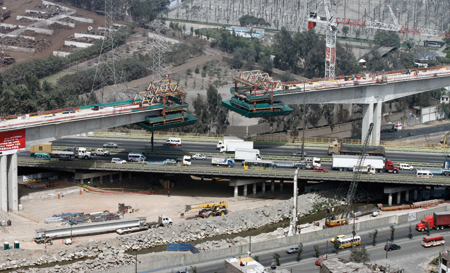 For bridges, the CVS cantilever carriage is a flexible high-performance system that offers high load-bearing capacity and adapts to varied deck widths. Proprietary walers form the backbone of both of these systems, to which specialised supplemental components are added according to project needs.